FILE - Four Afghan men look on in court during their trial in connection with the killing of a 27-year-old woman, in Kabul, Afghanistan May 6, 2015. An appeals court in Afghanistan has quietly overturned the death sentence given to four men involved in the brutal mob killing of a woman earlier this year. Fazal Manan Nuri, the defense attorney of one of the accused, Abdul Bashir, told VOA that three of the men convicted of the March murder of Farkhunda Malikzada were instead given 20-year sentences. The fourth convict was sentenced to 10 years because of his age. He was 17 years old at the time of the crime. The decision, Nuri said, was handed down Tuesday. The appeal was heard behind closed doors, with no journalists, nor even Farkhunda’s family present. FILE - Afghan women's rights activists carry the coffin of Farkhunda, an Afghan woman who was beaten to death and set alight on fire March 19, during her funeral ceremony in Kabul, March 22, 2015. ​The decision was kept quiet until a local TV channel, Tolo News, reported the verdict Wednesday based on anonymous sources. Details of the ruling have not been formally announced. The secrecy with which the appeals process was handled was the opposite of the trial, during which journalists and news cameras were allowed into the courtroom. Farkhunda, 27, was killed March 19 in a brutal attack that was sparked by false accusations that she desecrated the Muslim holy book, the Quran. Cellphone video showed people beating her with sticks, pushing her body from a rooftop and running it over with a car, before dragging it through the streets of Kabul, burning it, and dumping it in a river. The father of Farkhunda speaks at a hearing at the Primary Court in Kabul, Afghanistan, Wednesday, May 6, 2015. The attack sparked protests in Afghanistan and widespread outrage elsewhere, including condemnations by Afghan President Ashraf Ghani and the United Nations. 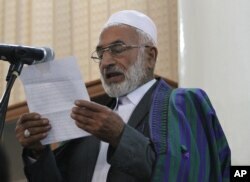 Afghan authorities promised swift justice. Thirty civilians and 19 police officers were arrested and charged with either participating in the attack or failing to stop it. Eight others were freed for lack of evidence. A court sentenced four civilians to death in May, including the cleric Mullah Zainul Abideen, who had falsely accused Farkhunda of desecrating the Quran. Eight others had been sentenced to 16-year jail terms. Eleven of the police officers received one-year jail terms while eight others were acquitted. Farkhunda’s family and human rights activists had expressed dissatisfaction with that decision. Police were blamed for failing to stop the attack on Farkhunda. 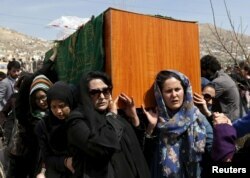 Women’s rights activists in Afghanistan complain of widespread violence against women. They say the country’s legal system does not take crimes against women seriously. Anisa Rasooli, a leading lawyer who has been nominated to become Afghanistan's first female Supreme Court judge. Ghani has promised to reform the judicial system. As part of his efforts to promote women's rights and representation in the government, last month he nominated a leading lawyer, Anisa Rasooli, to become Afghanistan's first female Supreme Court judge. The nomination, which requires parliamentary approval, has upset some Islamic clerics in male-dominated, conservative Afghan society. Ghani has also appointed two female governors in Ghor and Daikundi provinces. His cabinet includes four female members. He wants all ministries to start appointing female deputy ministers.